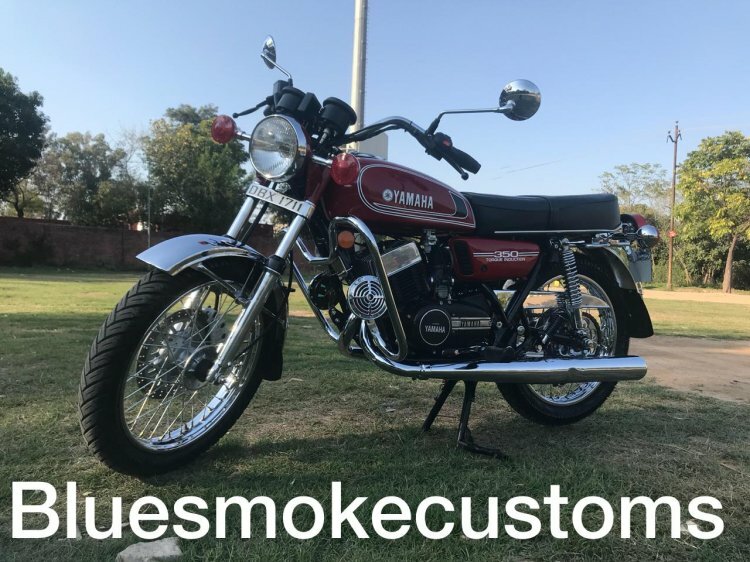 Prateek Khanna of Bluesmoke Customs is back with another neatly restored Yamaha RD350. The motorcycle you see in the images is a 1986 model that has been renovated and upgraded with a disc brake at the front. The braking setup has been sourced from a Bajaj Avenger, with an aim to enhance the stopping power. The 1986 Yamaha RD350 has received an upgrade to its anchoring setup with the addition of a Bajaj Avenger sourced disc brake at the front. Body parts required a replacement and the restored motorcycle received new mudguards, exhaust, meters, crash guard and saddle. Select engine parts, too, needed replacement. The bike has a US-spec cylinder with original Yamaha connecting rods. The cylinder head, crack and carburettor are also US-spec. The switchgear has also undergone a change, and it now includes an engine kill switch. The restored motorcycle features several chrome treated elements that give it a proper retro look. The fascia gets a chrome mask for the headlight while all the blinkers are mounted in chrome housing. The spherical shape of the headlamp, tail lamp and the blinkers give it a proper old-school look. Other chrome treated bits on the motorcycle include front and rear fenders, mirror housing, rims, crash guard, fuel filler cap and the chain cover. The motorcycle has a new paint job that gives it a brand-new look, along with an anti-rust coat for the fuel tank. The red paint of the bike is complemented by contrasting graphics that are seen in the shade of white and black. Yamaha logo and branding can be seen on the fuel tank while the side panels carry the “350 Torque Induction” badge. The engine gets a black finish that is enhanced with a chrome treatment to the head and Yamaha branding on the sides. The braking setup, as mentioned above, features a disc at the front and the stock drum unit at the rear. Suspension setup has remained unaltered, and the motorcycle rides on conventional telescopic forks at the front and twin-sided springs at the rear. Bluesmoke customs have retained the original saddle that features a ribbed pattern and a belt in the centre as well. 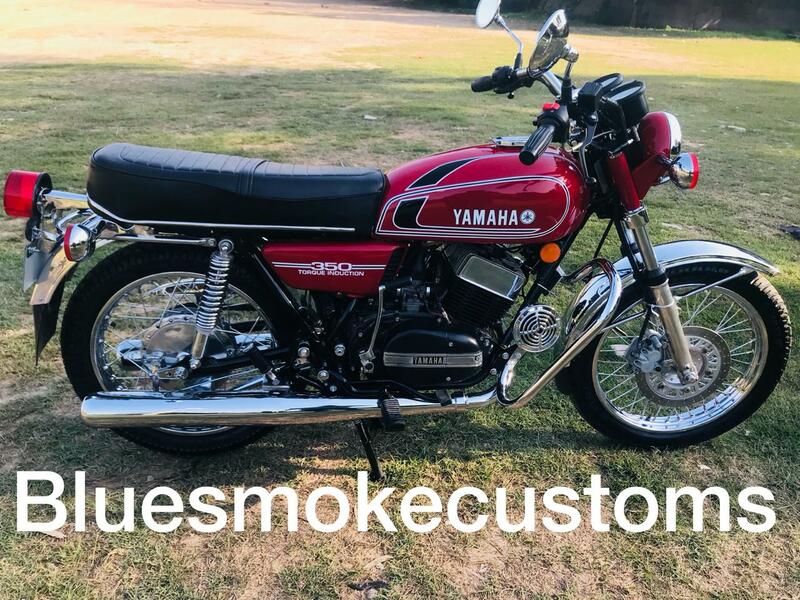 The Yamaha RD350 has a new paint job that gives it a brand-new look, along with an anti-rust coat for the fuel tank. The RD350 came in two power options – 'High Torque (HT)' and 'Low Torque (LT)'. The HT version, which initially produced 39 bhp, was re-tuned to deliver 30.5 BHP. The LT variant, on the other hand, makes 27 BHP.